Josh Marsden goes over for Kenilworth School's opening try. 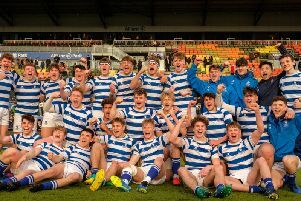 Kenilworth School Under-15s’ dreams of Twickenham success were ended by a second-half Will Morris hat-trick as Beechen Cliff School came from behind to win their Schools Vase final 36-14, writes Sophie Freestone. Ten minutes into the match fly-half Ollie de Glanville, son of former England centre Phil, was on hand to receive a slick offload inside the Kenilworth 22, slipping through the defence to score the game’s opening try. Captain Jac Therrien added the extras. Kenilworth responded almost immediately, working their way into the Beechen Cliff 22 before being driven into touch five metres out. With 16 minutes on the clock, their efforts were rewarded following some excellent work from the forwards, with captain Josh Marsden going over to open his side’s account. Fly-half Will Woolvine’s successful conversion levelled the scores. After the restart, Kenilworth were back on the attack, almost scoring again before a well-timed interception from Charlie Delargy allowed the winger to race down the right wing to score and nudge Beechen Cliff into a 12-7 lead. That score saw the momentum swing Beechen Cliff’s way but Kenilworth’s strong defence prevented any further first-half scores. Kenilworth started the second half brightly with Finn Yallop showing great strength to score just two minutes in. The conversion from Woolvine edged Kenilworth into a two-point lead but the advantage was short-lived. Beechen Cliff were back in front when the ball was shipped out wide to centre Morris who crossed in the corner for his first of the match. Therrien converted to restore his side’s five-point advantage and Morris was back on the scoresheet in the 48th minute, taking advantage of loose ball in the Kenilworth in-goal area to touch down. Morris then secured a memorable hat-trick after Daniel Boyle was superbly brought down by Kenilworth just inches short of the line. A sixth try through replacement Yuji Westmacott and converted by Therrien added further gloss to Beechen Cliff’s victory.